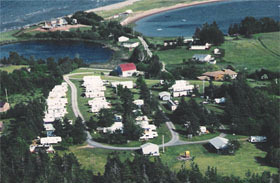 D&B RV Park is a fully serviced Seasonal Park with 64 seasonal sites and 1 weekly site. All sites have water, sewer, 30 amp cable TV and phone connection. The Park offers the 50 plus Camper a quiet relaxing place near the ocean to enjoy the summer months. Our park overlooks the ocean and the sandy beach where swimming, clam diggin and evening walks are some of the popular activities of D&B campers. In the evenings many campers take advantage of an open fire as an opportunity to play guitars and sing their favorite songs with friends, family and fellow campers. On the weekends there is always something happening. Some of our events include Christmas in July, Pot luck suppers in the pavillion, bingo, Sunday evening card partys and occasional dances with live entertainment. We are located along the beautiful North Shore of Nova Scotia, Canada. We invite you to come home to Nova Scotia and spend the summer with us by the sea.